Light and style is what Quorum Lighting will bring into your room. In its more than 30 years in the business, Quorum Lighting has been treating customers like a family. With their award-winning customer service, it offers lighting fixtures that will surely set your space apart and also deliver the look and feel that you are searching for. Quorum Lighting’s line of mini pendants comes in a wide range of finish from Cobblestone, Matte Black, Polished Brass Nickel to name just a few. Its modern contemporary style is the perfect complement to your home, bathroom or office lighting. 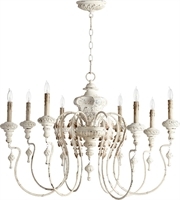 Complement any room in your home or office with the Persian white finish of Quorum Lighting’s transitional chandeliers. These lighting fixtures run on 6 candelabra base 60-watt incandescent lamps. Your room will truly shine out with these stylish and elegant lighting fixtures from Quorum Lighting. Experience style and elegance with these chandelier lines.